This Friday I'm thrilled to be conducting Nief-Norf at the Big Ears Festival here in Knoxville, TN on a live film score to the documentary Brimstone & Glory, in collaboration with NYC's Wordless Music. 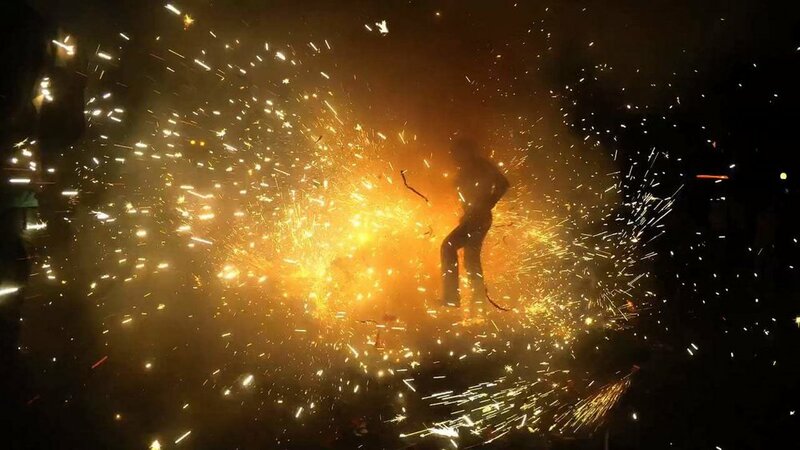 Directed by Viktor Jakovleski, Brimstone & Glory traces the National Pyrotechnic Festival in Tultepec, Mexico, a celebration used to pay tribute to San Juan de Dios. Here is the official trailer to the film. I was fortunate to be contacted about taking on this project by Wordless Music more than a year ago, and am thoroughly enjoying watching it take shape this week. The film is stunning to watch and the music, scored by Dan Romer and Benh Zeitlin, features a percussion quartet concerto with chamber orchestra. Wild grooves and beautiful melodies emerge throughout the score and I've become more and more engulfed with the entire work after each morning of studying. Friday's screening will be the first live performance of the score, using a newly orchestrated version of the score done by Sam Torres. One of the most poignant moments of the documentary, for me, traces a young boy named Santi and his courageous debate on whether to join the Dia de Los Toros (Day of the Bulls) with his older family members. As a Dad with a son at a similar age, I found myself feeling protective of Santi, and the narrative took me on quite an emotional journey. I so look forward to joining all 22 musicians on stage Friday for our live score performance of this film in Knoxville's historic Tennessee Theater at 1:30pm. There isn't a better venue out there for such a concert or a better audience/festival to share this project with.